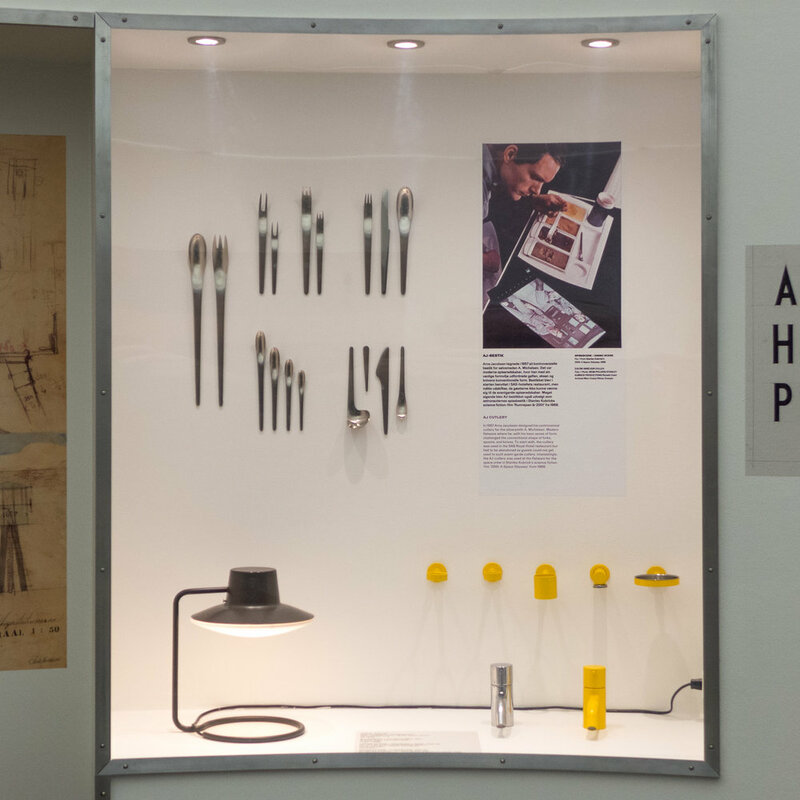 Sometimes it can be as interesting to look at the display cases and the style of the information labels and the lighting in a museum as it is to look at objects on display … and, for obvious reasons, more so when you are in a design museum. 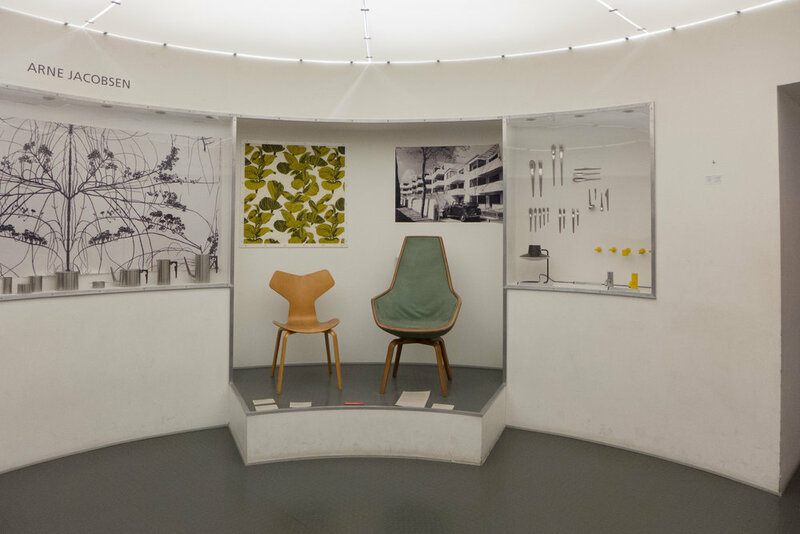 At Designmuseum Danmark they have a space dedicated to furniture designed by Arne Jacobsen. I'm not sure of the date of this display but I would guess that it is over twenty years old. It is a substantial structure and is itself quite a design item so I can see exactly why it should be kept. The space is actually square and is on a main through walk down the right-hand range of the museum but under a false ceiling, lit to throw light down into the space, there are three curved areas with raised platforms to make the space circular and that is where furniture by Jacobsen is displayed and there are two large shallow display cases recessed into the walls plus wall space for photographs and panels. 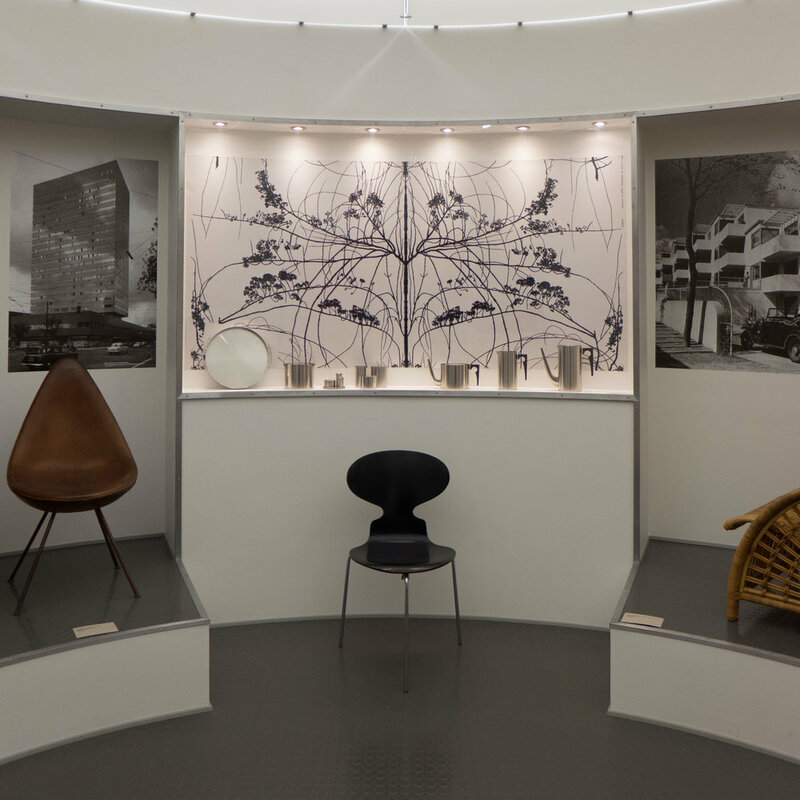 These curved platforms pick up shapes in the House of the Future that was designed by Jacobsen in 1929 - in partnership with Flemming Lassen - and as the display includes a copy of a drawing for that house so the echo must be deliberate. The advantage of this form of display is that the furniture is lifted clear of the floor, giving the pieces at least some protection, but the pieces can still be examined up close and raised up so anyone interested can see some of the details of the construction particularly on the underside. Jacobsen is without doubt one of the most important designers from the classic period of modern Danish design in the 20th century and is certainly the Danish designer who the most foreign visitors will know at least something about so I can see exactly why he is given this special treatment. A recent remodelling of a space further along the same gallery pulls together in one place some of the works in the collection by Kaare Klint but presumably it is felt that to separate out other individual Danish architects or designers for the same treatment would be too greedy on space and make the museum displays rather too fixed in the works and the themes that they explore. The Jacobsen gallery has just been redecorated and looks good for its fresh coat of paint and for the replacement of photographs that had begun to curl at the edges. What is more interesting is that some of the furniture has been moved around and new pieces brought in so chairs designed by Jacobsen for St Catherine's College in Oxford in the 1960s have been removed. 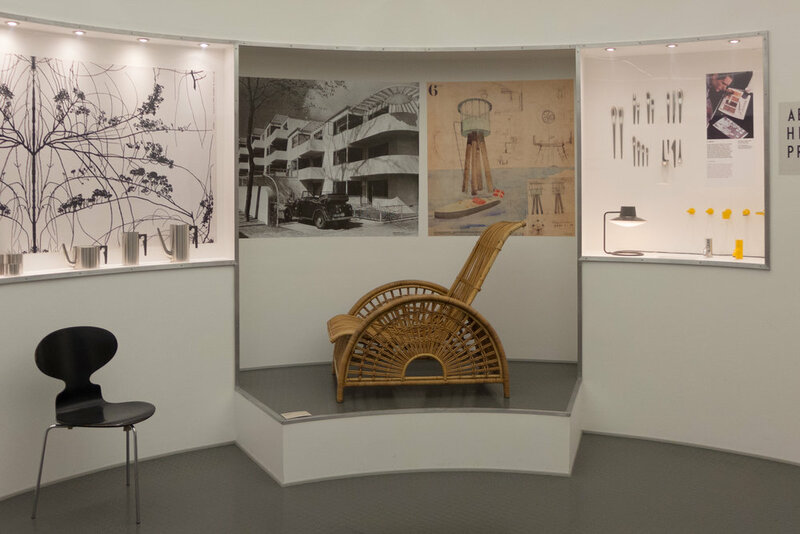 These were less obvious key pieces in the history of Danish design although they show the most refined and most sophisticated use of plywood for furniture in any designs by Jacobsen. 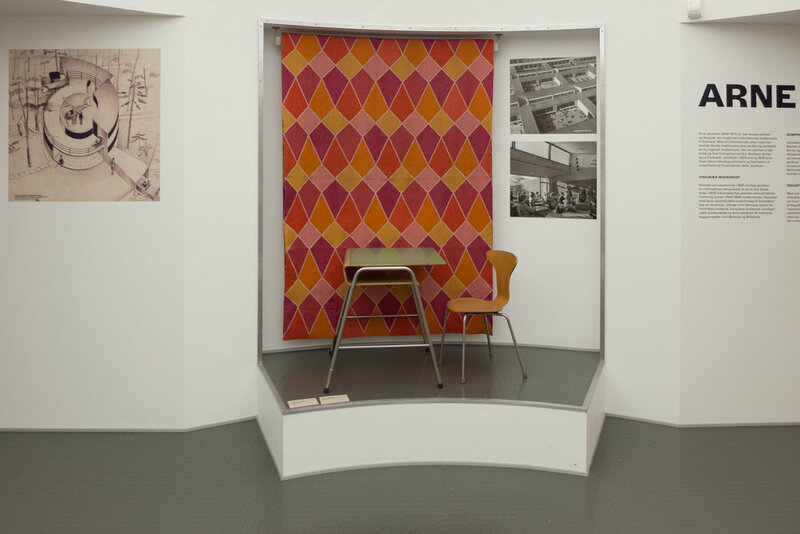 They have been replaced with a chair and a desk and a sample of the fabric designed by Jacobsen for Munkegaard Elementary School in the early 1950s. The main chairs that Jacobsen designed for the SAS hotel in Copenhagen remain - the Egg, the Swan Chair and the Drop - all still in production sixty years later - but the Giraffe Chair that Jacobsen designed at the same time for the dining room of the hotel has gone back to store which is a pity because it shows a very different style and form of chair but just one that did not receive the same popular acclaim as the other designs. 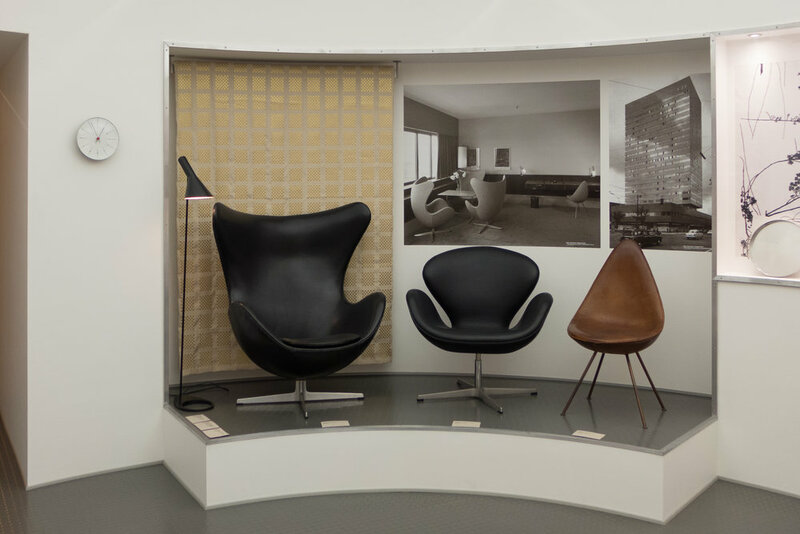 My one criticism of the display is that it shows the ever-present Danish understatement and modesty about what Danish design did and does achieve. The display cases show the cutlery and the glassware and lighting and so on that Jacobsen designed for the SAS Hotel and there is the absolutely remarkable thing. Arne Jacobsen designed the SAS Hotel, and the air terminal that was originally in the same building, in a style and with a method of concrete pouring that was barely known in Scandinavia and untried at the time in Copenhagen so just for the building design and construction a huge challenge. 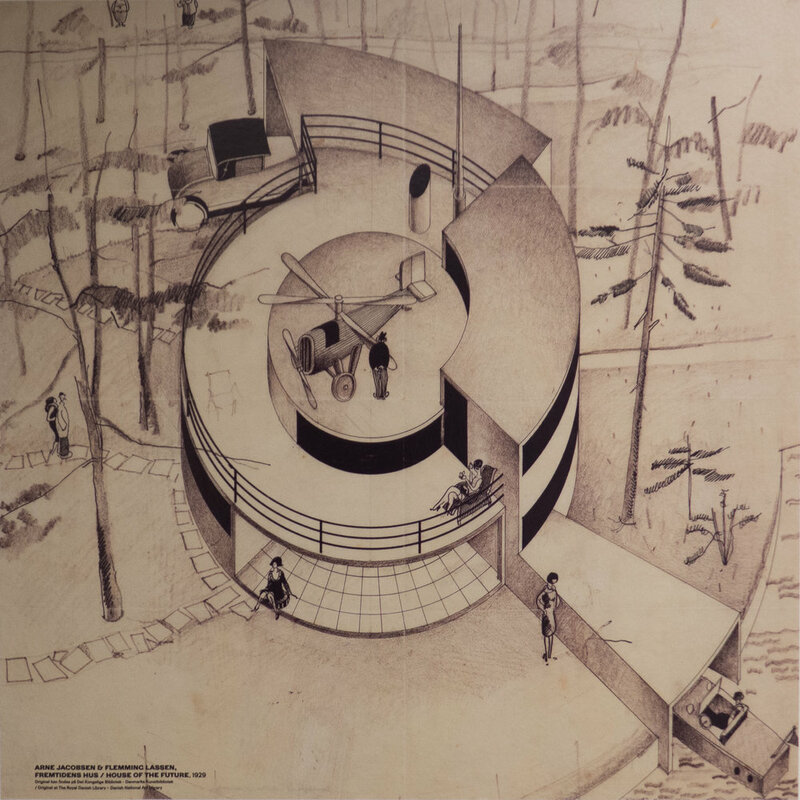 It is known that Jacobsen had a small drawing office - certainly very small by modern standards - and the core team was actually working in an office in his own home outside the city in Klampenborg in a way he had developed in both the first and the second house as well as this the third house he designed for himself and his family. Yet at the same time, and in a remarkably short period, he designed not just a complicated and challenging building, but also all the furniture including six chairs, at least two of which became truly iconic designs and four of which used innovative materials for an almost unique form of shell design (the first chairs were made with expanded polystyrene) and he designed carpets, upholstery textiles and all the tableware needed for a large hotel and all equally innovative and all in a period of about five years. This work by Jacobsen for the SAS Hotel is often described as a good example of gesamtkunstwerk - total design - but even in Denmark that should be taken to be a bit of understatement. Surely the hotel and its interior should be lauded as one of the most incredible personal achievements by any architect in the 20th century.